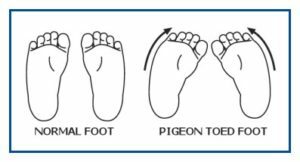 Metartarsus adductus: Is when the digits deviate inwards in comparison to the rearfoot giving a C-shaped or banana foot appearance. Matatarsus adductus is the most common foot condition that gives rise to an intoed gait pattern. Internal tibial torsion: Is an internal twist of the tibial-fibular unit (shin bone) which causes the foot to pronate and the knees to become knocked (Genu Valgum). Femoral Anteversion: Is a twist in the shaft of the femur and causes the knees to become knocked and the lower limb and foot to rotate inwards. In addition to the structural factors, intoeing gait is commonly seen in children with cerebral palsy. Cerebral palsy can cause internal rotation through the hips and spasticity of the adductuor muscles and medial hamstrings which can manipulate the femur and tibia into internal rotation and thus create an intoed gait.